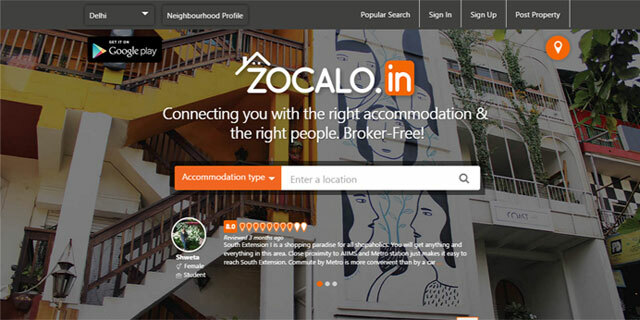 Zocalo.in, a brokerage-free listing platform for rentals and paying guest accommodation, has raised an undisclosed amount in seed funding from startup accelerator GSF's Rajesh Sawhney, MakeMyTrip co-founder Sachin Bhatia and others. WebChutney co-founder Sidharth Rao; Mahesh Parasuraman, former managing director of the Carlyle Group; Dheeraj Jain, partner with a UK-based hedge fund and other investors also participated in this round of funding. Zocalo Realtech Pvt Ltd, which owns and operates Zocalo will use the money to expand geographical footprint, increase team size, augment the technology platform and up marketing spend, said Uday Lakkar, founder of the company. The startup was founded in May 2014 by IIM-Ahmedabad graduate Lakkar, who is a chartered accountant. He worked with McKinsey, Morgan Stanley and EXL before starting Zocalo. Zocalo connects individuals directly with long-stay accommodation providers with listings of hostels, PGs, shared and rental apartment information. In effect it seeks to target singles, either working professionals or students, who generally opt for such shared accommodation through an unorganised channel to share costs of rentals. "Zocalo was born from my own experience of being a migrant and how students and young professionals generally find it difficult to get rental accommodation. We heavily bootstrapped the company in the last one year," said Lakkar. Now present in Delhi NCR and Mumbai, the startup has an inventory in excess of 75,000 PGs & hostel beds and more than 10,000 accommodation listings. Around 6,000 new listings are being added every month. Its Android app has seen over 1,500 downloads thus far. The company also has tie ups with movers and packers to assist customers who are moving houses. Zocalo also claims to provide authentic reviews of flats and nearby facilities from current and earlier residents. Several online platforms for brokerage-free rental listing have attracted investor attention. Last month, Bangalore-based Nestaway Technologies Pvt Ltd, which runs an online managed home rental marketplace for singles by the same name, raised Rs 76 crore (approximately $12 million) in funding from consumer e-commerce venture Flipkart and its investor Tiger Global. MakeMyTrip Ltd. Rajesh Shawney Sachin Bhatia Webchutney Studio Pvt. Ltd. Zocalo Realtech Pvt. Ltd.